Not to be confused with Toad Town Caves. The Toad Town Tunnels are the sewer system beneath Toad Town in Paper Mario. They are a massive series of passages with Warp Pipes and Blue Pipes that connect to all major areas of the game, with the exception of Shy Guy's Toy Box and Flower Fields, both of which are accessed directly from Toad Town. The main pipe to the tunnels is in the area of Toad Town with Tayce T.'s house and the entrance to Forever Forest. The secondary entrance/exit is in the blue house to the north of the main entrance. 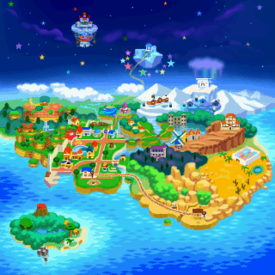 Mario is required to go here to get the Ultra Boots and go to Shiver City in order to start Chapter 7 of Paper Mario, but going to other areas of the tunnels is optional. All pipes to other places are "shortcuts" and are not accessible before visiting that place. Much like Rogueport Sewers from Paper Mario: The Thousand-Year Door, the Toad Town Tunnels have few areas available at the start of the game. 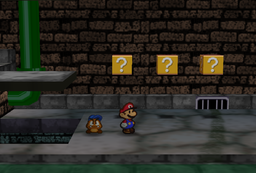 The more upgrading items, powers and party members Mario have, the more areas of the sewer Mario can travel to. Three Blooper fights occur here, and many Badges, Star Pieces, and Super Blocks are scattered around the area. The salesman Rip Cheato can be found at the second entrance/exit. 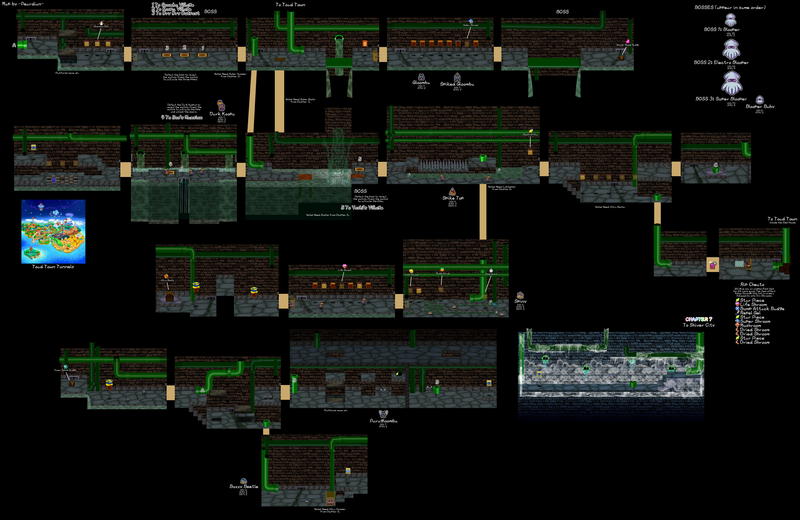 The in-game map description reads, "The system of tunnels runs under Toad Town. There are many pipes inside-- some of them are shortcuts." In the south part of Toad Town, there is a pipe to the southwest of the crossing. The area is marked "Private" on a notice board nearby. By going through the pipe, Mario reaches the "entrance" area of the Toad Town Tunnels. There is a path east, a path west, and a wooden floor on the ground. At the beginning of the game, Mario and his partners can only go east. There is a gap with a wide pipe as a bridge. Then comes a Save Block. 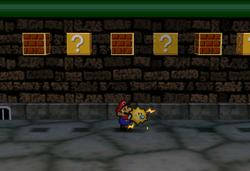 Mario can smash the Yellow Block at the door to proceed. In the next room is a Gloomba as well as a line of brick blocks, some of which contain coins. One brick block has a Spiked Gloomba lying on it. There is an invisible block among them containing a Super Shroom. In the final room, there is again a gap with a wide pipe as a bridge. After crossing the bridge, there will be a Blooper guarding the treasure chest to fight Mario. After defeating the Blooper, Mario can get the Shrink Stomp badge in the treasure chest. After getting the Super Hammer from Dry Dry Ruins in Chapter 2, Mario can smash the Stone Block blocking the door and go to the room to the west. In the first room is a Blooper fight, after which an ! Switch drops which will unlock the shortcut pipes to Goomba Village (Prologue), Koopa Village (Chapter 1), and Dry Dry Outpost (Chapter 2). In the second room, Mario encounters three ? Blocks first (the middle one containing a Snowman Doll), platforms that go up, and finally a pipe leading to a new area beneath. To the left of the new area are two Spiked Gloombas hanging around, a brick block with a trampoline above it, and the Power Smash badge in a high treasure chest. To the right of the new area is a gap with two platforms that form a seesaw, and a door with two Spiked Gloombas across the gap. In the next room there are gaps in the higher place, at the end of which is a Star Piece. Mario can take the platforms that go up in the room to these high areas as well as to the ceilings where he can find another room with a Super Block. There are Paragloombas here. Finally, in the southeast of the new area is a pipe leading to a room with a Buzzy Beetle, two Metal Blocks, and another Super Block. After getting the Super Boots from Boo's Mansion in Chapter 3, Mario can break the wooden floor in the entrance area and go to the room beneath it. There is water to the right of where Mario lands. There is also a pipe that allows Mario to go back and two rooms to the left. The first room has three Dark Koopas, defeating all of which will reveal a ! Switch that can unlock the shortcut pipe in the room to Boo's Mansion from Chapter 3. 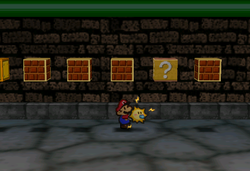 In the second room to the left, there is also a movable block in the lower place that can be used to hit three invisible blocks to fill the gap, and a Super Block across the gap in the higher place. The path to the right is required to start Chapter 7. It is available after getting Sushie from Chapter 5. After crossing the water with Sushie, a Blooper fight occur, after which drops a ! Block that unlocks the shortcut pipe to Yoshi's Village. In the first room to the right of the water area there are two Dark Koopas, a high ? Block with a Shooting Star in it, and a pipe in the north protected by a gap filled with spikes. Mario has to ride on Lakilester to pass the spiked area for the Ultra Boots before he can proceed to Chapter 7. The pipe goes beneath. The first room beneath has zigzag paths, with Spinies and hidden blocks containing a Maple Syrup, a Stop Watch and a Volt Shroom. The second room beneath has wider grounds, with two Dark Koopas and a line of high blocks at the center of which is a hidden block containing a Life Shroom. The final room has trampolines, and the Ultra Boots at the end. After getting the Ultra Boots, Mario can hit the high blocks in the previous room and in the room before descending to this area. 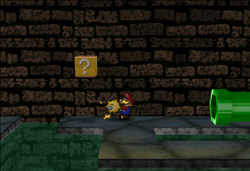 In the second room to the right of the water, there is a gap that can be crossed by hitting the invisible coin blocks with the Ultra Boots on the lower ground. Across the gap is the blue door. 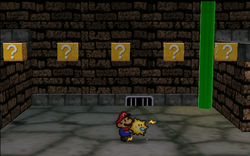 Although it is possible to reach the blue door immediately after getting Lakilester and therefore the Ultra Boots, it won't open until Mario visits Merlon's house and meet the Ninji before Chapter 7. The room behind the door has a single pipe leading to a frozen area, in the left of which is a Super Block and to the right of which is the pipe to Shiver City. Finally, there is a pipe in the southeast of the gap area that go down to a room with cracked wall on the right. Blowing up the wall with Bombette reveals the last room in the tunnels, with Rip Cheato selling items and a pipe to the blue house in Toad Town. In Toad Town, there is a blue house to the north of the entrance pipe of Toad Town Tunnels (called "Odd House" in the description of Odd Key). There is a Toad near the blue house commenting on Princess Peach. The house is locked from the inside at the beginning of the game. After Mario and friends clear the tunnels, they can take the pipe in Rip Cheato's room to go to the inside of the house. The Odd Key can be found inside, which can then be used to unlock the house from inside. After this, the blue house will serve as the second entrance/exit of the Toad Town Tunnels. For enemy formations in Toad Town Tunnels, see here. The three Bloopers will always appear in the order of the 30 HP Blooper, 50 HP Electro Blooper, 70 HP Super Blooper, regardless of where Mario encounter them. In addition to the items listed below, several kinds of items can be purchased from Rip Cheato. Super Shroom In the invisible block in the area to the east of entrance. Shrink Stomp In the treasure chest at the end of the area to the east of the entrance. Snowman Doll In a ? Block to the west of the entrance but before the pipe leading to the new area. Power Smash To the west of the entrance is a pipe leading to a new area. This item is in the treasure chest to the west of that. Star Piece To the west of the entrance is a pipe leading to a new area. This item is in the high place in the area to the east of that. Shooting Star Beneath the entrance room, the item is in a high ? Block on the path to the right. Ultra Boots required. Maple Syrup Beneath the entrance room, there is a pipe by the path to the right that eventually leads to the Ultra Boots. In the first room down the pipe, the item is in an invisible block to the west of the entrance. Stop Watch In the same room, the item is in an invisible block halfway in the middle road. Volt Shroom In the same room, the item is in an invisible block by the visible ? block near the exit. Life Shroom In the next room, the item is in a high invisible block among the visible ones. Ultra Boots required. Super Shroom In the area one screen east from the entrance, the hidden ? Block is in the middle of the gap in the row of blocks. 1 Coin each In the area one screen west of the blue Warp Pipe to Boo's Mansion is a gap between the two high platforms with the Super Block on the western one. There are three hidden ? Blocks in this area. 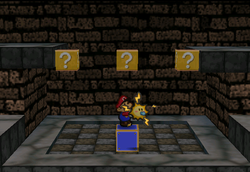 Using the blue movable block, Mario should move it to the middle of the left side, the center, and the middle of the right side and jump from the movable block at those spots to reveal them. Alternatively, Mario can also hit the invisible blocks from the tiles without using the movable block using the Tornado Jump if he's equipped with the Ultra Boots. Maple Syrup In the area two screens east of where the player obtains the Ultra Boots, near the starting pipe, Mario should jump at the center of the pathway sticking out to reveal the hidden ? Block. Stop Watch In the same area, from the pipe, Mario should follow the central path going east. The hidden ? Block is located just before the path splits north and south. Volt Shroom Also in the same area, near the doorway, the hidden ? Block is west of the visible one. Life Shroom In the next area, the hidden ? Block is between the two sets of three blocks. The Ultra Boots is needed to hit the block. 1 Coin each In the area two screens east of the blue Warp Pipe to Yoshi's Village is a gap between two high platforms, with a doorway leading to Shiver City in the east. There are four hidden ? Blocks in this area. From the visible ? Block touching the western platform, Mario should move three block lengths from it and Tornado Jump to reveal the first hidden ? Block, then continue to use the same method for the next blocks to reveal them all. Ah, Toad Town Tunnels! Visit its scenic filthy streams that lead to who-knows-where! It's spectacularly disgusting! Come stay awhile! If you're not totally grossed out the first night, you stay for free! You know, even though these tunnels have many sections you can always count on one thing: filthy, stinking water. Would it be too much to ask to get out of here before the stench knocks me out? Seriously! I'm about to wig out! Ugh! I wonder where the filthy water is going? This'd better not drain into the sea or the river! I may have to alert the Goomba Environmental Board! We're in Toad Town Tunnels. Eew... I wonder what's making the water drip from up there? At best, I guess this place could be called "damp". Although "dank" is more like it. Let's see...disgusting flows of water...dripping ceiling... Yup, it's gross down here! Can we leave now? I... I'm really uncomfortable. You know, I really don't like foul water dripping on me. Ugh! That one hit the back of my neck! Blech! Where's it dripping from? Can we get out of here or what? I hate it here! This is a strange, dark place. Who'd think that a place like this could exist beneath lovely old Toad Town? The cool air is certainly nice and refreshing... but it's too dark, it smells awful and I have a bad feeling about this place. Let's move! Uh... I think this is a sewer. You know...the Toad Town sewer. Under Toad Town. What am I saying? You know! You're a plumber, after all! Oh, gross! I've never seen so much sewage in my life! Eew... floating garbage, too! Talk about disgusting! I'm sure that some nasty things live down here in the dark. We should be ready to defend ourselves in case of a surprise attack. Oh, gross! Look, Mario! The water's filthy! And look! Garbage! These tunnels are a total nightmare. Let's keep moving and get out fast. Still Toad Town Tunnels... We've been in these tunnels so long that it's starting to feel like... I'm becoming a mole... haha! It looks like just another passage in the tunnels. I get the feeling... that something valuable rests around here... Can't you feel it in your bones? Do Goombas have bones? Anyway, something big is near... I'm almost positive. "It smells of treasure here." How was that? That was my Kolorado imitation. Any good? Mario? Hello? It just keeps getting grosser down here, huh, Mario? Where are we...? Are we lost or what? We've been down here so long... You know, I didn't know that adventuring would be this gross. Boy, who could live down here? What a crazy dude! It's a small room with a single pipe in the center. Don't quote me, but I'm betting that the pipe goes somewhere. The tunnel is freezing! I should've worn a sweater! What do you say we go someplace a bit warmer? Mario getting a Star Piece from Rip Cheato. Although there are shortcuts to several locations in the game, they can be unlocked only from the tunnels. 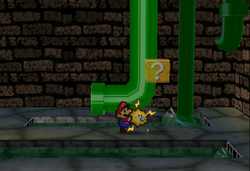 Jr. Troopa appears immediately after Mario gets the necessary equipment so it is not possible to unlock the pipes before encountering him. It is possible to use a glitch to go into the blue house in Toad Town directly, by jumping at a right spot on the wall of the house, therefore entering the Toad Town Tunnels from the other end. 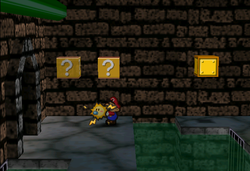 Unofficially dubbed the "Blue House Skip", this trick has been used among speedrunners of Paper Mario to skip to Chapter 5 at an early stage. KagemitsuP (May 14, 2013). 【TAS】 マリオストーリー Any% WIP 【Part3】. Nicovideo. Retrieved May 14, 2016. ↑ Malleoz (March 9, 2015). Submission #4587: Malleoz's N64 Paper Mario in 1:30:40.15. TASvideos. Retrieved May 6, 2016.